LOW …unless you happened to enjoy the gameplay improvements in previous entries. WTF Look, I’m not letting this go. Everybody’s Golf is an awful name. There’s something about golf. People who play videogames don’t tend to be the kind of people who play golf (or watch it. Or care about it in the slightest.) But, it seems like most of us are down to hit the digital links occasionally. With the thoroughly disappointing release of Rory Mcilroy’s PGA Tour a couple years back, those needing a digital fix have found the opportunity surprisingly scarce on the current generation of consoles, with The Golf Club being the only other option until now. 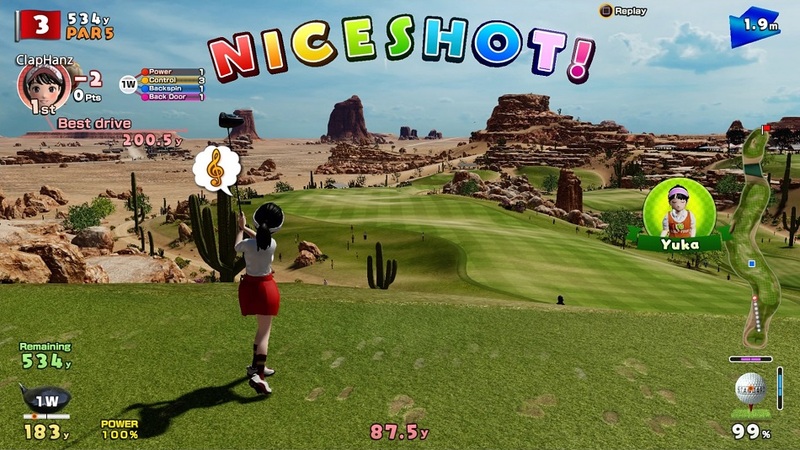 One of the tentpoles has long been Sony and Clap Hanz’s Hot Shots Golf, now been renamed to Everybody’s Golf to create brand synergy across the globe. Given the complete wasteland that is modern golfing games, it’s the perfect time for Sony to bring out a new entry in the franchise. Unfortunately, while there’s a lot to like here, nearly everything new either adds nothing, or worse, takes away from the enjoyment of the series’ arcade-style play. The big addition to this PS4 entry is Golf Island, which allows the player’s custom character to walk around and sign up for tournaments or head to the pro shop in a manner that feels like an unnecessary replacement for a simple menu. The island has little to do outside of entering tournaments — there’s fishing, I guess, and there’s a golf cart to ride around in, but otherwise it’s empty. Sure, Golf Island and the overarching world of Everybody’s Golf is a bright and cheerful place, but it’s not very detailed, with flat textures and painted-on facial features that make things feel low-rent (which makes sense given it’s budget $40 price). For PS4 Pro owners, the game can look much sharper with 4K resolution support, and for those lucky enough to have an HDR display, the greens truly pop off the screen. Alas, for 85% of the people reading this, expect a rather simple graphical experience. While the in-depth character creator will allow players to make fairly accurate chibi versions of themselves (or Golgo 13, Lupin III, or any number of other anime characters) there’s definitely a tradeoff. Everybody’s Golf has been known for its cast of eclectic characters, but the last two entries on PS3 and Vita started to move away from that. With this version, it’s been dropped entirely. There’s not much personality in the other golfers — they have limited animations, they’re clearly made with the player character creation tools, and none have any of the soul previous opponents had. I found myself looking at Golf Island’s statue of series mainstay Suzuki doing his trademark Degeneration-X crotch chop and wondering why none of the new cast measure up. While the core gameplay of the franchise remains intact, there are some significant changes that may frustrate or confuse series fans. My biggest concern was the loss of the ‘advanced swing’ mechanic — it removes the percentage bar on the bottom of the screen in favor of stroke power represented by timing button presses in accordance with the angle of the swing. I am completely baffled as to why it was removed. Also, one of the things I’ve always liked about Everybody’s Golf as a series is how soothing it can be, and one addition negates this almost entirely. The game takes character data from other people playing within the region, and incorporates them as digital avatars. This creates a completely chaotic screen with eight golfers lining up at the tee and hitting their shots all at once, which I found to be incredibly distracting. In every other golf game, virtual or real, the player has the ability to concentrate while lining up the perfect shot. Now, it’s now much harder to focus with a bunch of anime characters screaming “YES!” while their balls fly into view. For online play this is fine, but solo golfing offline should be just that. 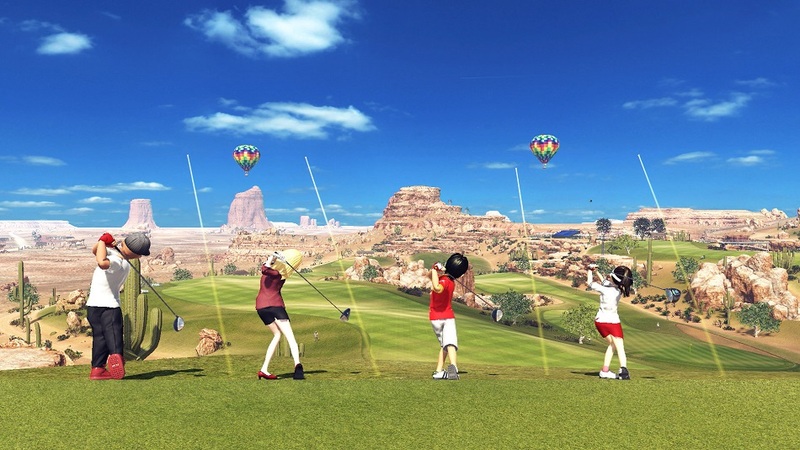 Speaking of online, Everybody’s Golf offers an assortment of online modes to challenge players worldwide, and it works well for challenging friends and strangers alike. The new ‘turf war’ mode is pleasantly frantic as golfers are split up into teams and run around the golf course attempting to one-up the opposing side’s best score on each hole. There’s traditional stroke and match play options too, and the online multiplayer in general is a smooth, easy-to-navigate experience. The online is also a good way to rack up EXP and unlock new things, which may be the biggest problem with the game — be prepared to spend a lot of time grinding to unlock new clubs, accessories and courses. Expect to play the same 18 holes for five hours at a time because building up a ranking requires playing the same course over and over and over again with slight variations (such as a bigger hole or on a mirrored version of the course) until enough EXP is earned to face off against a challenger. Grinding has always been a part of the series, but it’s taken to an absurd degree here. Disclosures: This game is developed by Clap Hanz and published by Sony. It is currently available on the PS4. This copy of the game was obtained via publisher and reviewed on the PS4. Approximately 20 hours of play were devoted to the single-player and multiplayer modes. Parents: According to the ESRB, this game is rated E For Everyone. The rating warns of Mild Language and Mild Suggestive Themes, but I could not locate any such things in this perfectly family-friendly product. Deaf & Hard of Hearing Gamers: The instructions and character interactions are presented via text, and there are no significant auditory cues, so there shouldn’t be any issues. Remappable Controls: This game’s controls are not remappable.